Vasanth Rao was born and brought up in a typical South Indian Brahmin family. Rangoli art got him to the realm of art. He mentions of how art in the simplest forms such as lines and patterns that communicate cultural and spiritual contents fascinated him since childhood. It is natural that he didn't take much time to realise his knack in this area. Vasanth is a self-taught full time professional artist. Before taking up art as full time profession, he gathered wide experience as a designer in print media, social work and teaching. He has a post graduate degree in sociology and a diploma in art appreciation from Australia. In the last 15 years, he has had various solo shows and has also participated in many national and international group shows, art projects and art camps. His art works are in public and private collections in India, Australia, Dubai Switzerland, England and US. He was conferred with the state award by Upadhyaya Art Foundation, 'Upadhyaya Samman' in 2013. Defining art as 'mastering simplicity', Vasanth states: "Simplicity has an aesthetic value". Simple lines, forms, space and colour make up his artworks. He relieves that 'art' happens simply one does not do it. For him, every' moment spent in the studio with a canvas and brush is a much- needed channel for creative expressions to flow. "This channel is the conduit in where art simply flows from the soul through feelings and influences onto the canvas. In fact I feel that the mind and intelligence have no roles to play in art." Vasanth says that honesty and innocence are the two expressions that has influenced his art and hence his personality. He believes in expressing rather than impressing. As a child he has always found that schools, colleges, universities, homes and holy-shrines in our society have a strong leaning towards 'impressing' rather than ‘expressing’. 'They are all busy in explanations rather than experiences. Pages of information have been mistaken for wisdom qualifications as knowledge making us live as hypocrites and being materialistic that has pushed us into the deadly competition fueled emotions like jealousy, ego and selfishness. This is where in all good measures, I beg to differ and dare to cut across. I relieve in expressing rather than impressing. And abstract art has this power to express yourself," he adds. Vasanth explains that while he was growing up, folk and cultural art practices like Yakshagana, Kola and Tiger dance of South India left a deep impact of colours in his heart and soul. Even today, one can see its influence in his paintings. Vasanth asserts: My visual language is more exploratory and I try to replicate the rhythm of my intuitions. The sincere effort has been to make a poem of my silence and loneliness. I've fallen in love with my silence and loneliness so much so that it has become a positive addiction for me. This silence is my work zone and the birth place of my ideas. It simply ends up as 'art meditation' wherein I find eternal peace." As an artist, Vasanth moves deeper to explain what abstract art really means to him He says that we keep talking to ourselves and keep thinking, however, we have never really observed the conversations we have with ourselves. Further, we often restrain ourselves to express our feeling, likes and dislikes and try to manipulate ourselves according to the people around us. He says that at times, even if we are right, we are forced to change our views just trying to either impress others or feel weak and suppressed. In this process the 'self' is suppressed so much that we almost feel the vacuum. However, art helps to develop all the courage needed to the fear of expression. According to Vasanth, abstract art has a power to help us communicate with ourselves and express freely. It helps us discover ourselves brilliantly to connect and relate with the world and nature. He stated that all great artists have followed this path and they have discovered and communicated through nature. He continues: "Art is divine and spiritual. It is never bothered about success, about sales, about exhibitions. It never feared mocking or criticising. It never let external factors influence or govern them. Artists developed a capacity to listen to their intuitions and express them freely in the most artistic way. They simply developed a great relationship with their own self, and that is why they could create masterpieces. It is art that chooses them as great artists'." The series of Colour Engineering consists of paintings that are spontaneous and automatic. 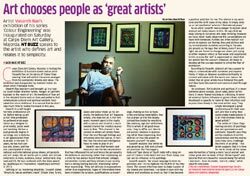 Vasanth says they are his creations from the subconscious and the expressions they carry challenge the limits of an artist. “This series suggests that it is time for me to break all the namesake formalities of being a mere 'social animal' and rather grow and be more of that 'divine myself and become that very beautiful 'natural being' for which I was born… born to create… born to colour," artist Vasanth concludes.